Originally developed by Cleaning Expert and Shopping Channel Guest Joe Campanelli for professional cleaning services. 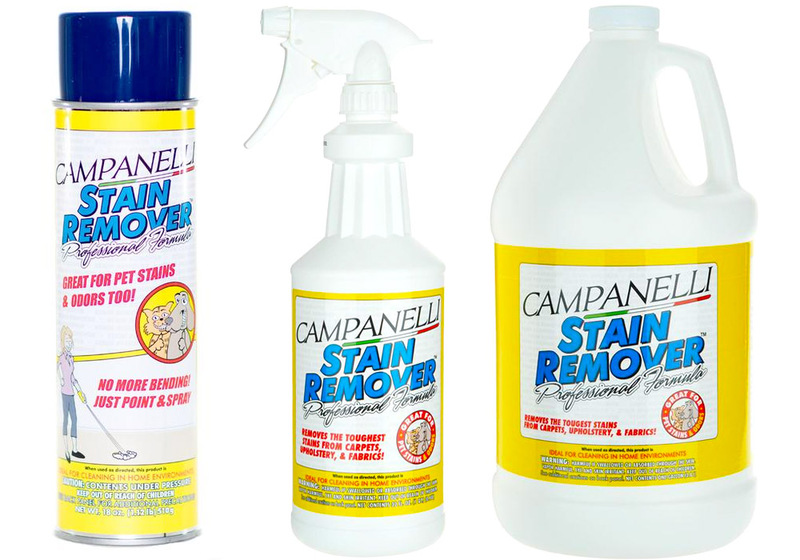 Our Stain Remover was available exclusively through professional floor care stores only, but as word spread, Campanelli Products™ Stain Remover quickly became a favorite with homeowners. It also became the best selling stain remover on the worlds largest shopping channel! • NO BENDING, RUBBING OR SCRUBBING! Point & spray foaming aerosol lifts, separates & emulsifies stains. • TRUE PROFESSIONAL FORMULA. Developed by Cleaning Expert and Shopping Channel Guest, Joe Campanelli. • BEST PET STAIN & ODOR REMOVER. Removes urine & feces while eliminating odors. When used as directed, safe for use around your pets. • REMOVES: Dirt, Grease, Oil, Coffee, Wine, Soft Drink, Condiments, Makeup, Pet Stains, Odors, & more! It's simple. Just point and spray and let our exclusive foaming action do the work for you. Our Stain Remover will remove virtually every household and pet stain instantly. Usually, there is no bending, blotting, rubbing or scrubbing required. No need to call a professional to remove stubborn stains those supermarket products can't remove. It's ideal for your carpets, upholstery, fabrics, and cloth auto interior. Now you're the professional, saving you time and money.